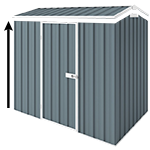 This large Regent garden shed is manufactured from low maintenance ribbed steel sheeting and is designed to add value to your home. Regent Sheds have a wind rating of N2 to withstand winds of up to 147 km/hr. For permanent and secure installation it is recommended to use concrete anchor sets. To anchor your shed to your concrete slab you will need 14 anchors for this size.